The Times Of India Film Awards 2013 took place in Vancouver, Canada last Saturday evening, with a host of Bollywood stars taking to the red carpet! It was one of the biggest and most glamorous events of the year! Take a look at the pictures from the event with these celebrities glittering in designer wear. Priyanka Chopra wore a black halter neck gown with gold embroidery by Arphan Vohra. This beauty added a Louis Vuitton black satin clutch, which also had a gold accent. Her side-swept curly locks and elegant poise really completed her look! Ilena D’Cruz wore a Dolce & Gabbanna Fall 2004 gown while her partner for the evening; director Prabhu Deva came in dressed all-fly in a dapper navy blue suit. Aditi Rao Hydari looked great in an orange strapless Gauri and Nainka gown and we loved the bright lip color on her! Mr. & Mrs. Khan brought red to the red carpet! Gauri Khan was wearing a saree designed by Tarun Tahiliani. Anushka Sharma looked different and picked an adventurous style in a Dior suit. She changed her outfits as she was hosting the ceremony and was seen in a Manish Malhotra saree and also a Gucci python print dress. 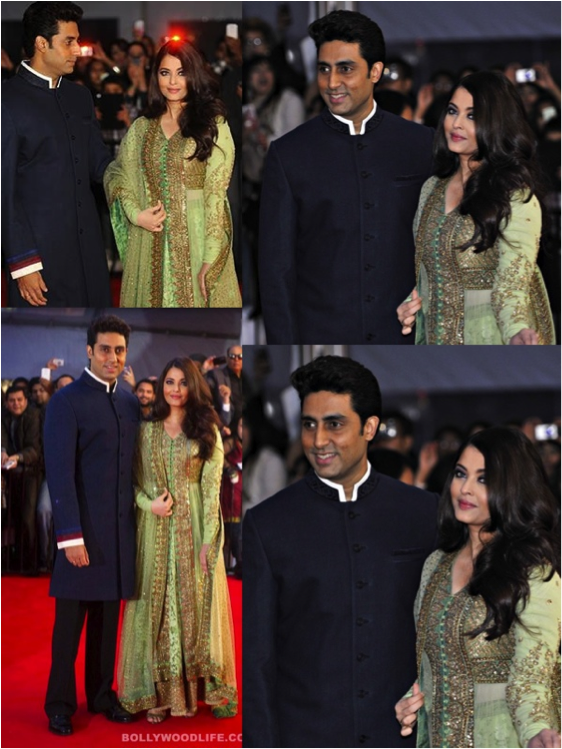 Abhishek and Aishwarya Rai Bachchan both looked lovely in Indian attire. Aishwarya Rai was wearing an outfit from Sabyasachi Couture. And we also love Abishek’s traditional jacket! Neha Dhupia also wore a lengha from Sabyasachi couture and looked absolutely gorgeous! A clutch from Pinky Saraf and green fan-syle earrings by Amrapali finished out her look. During the show she was seen wearing Anamika Khanna on stage performing. Chitranda Singh wore a Resort 2013 Naeem Khan. Her white gown featured gold embroidery, which was so exquisite! The cute and bubbly Zarine Khan looked marvelous in a blue gown with silver detailed work on the sleeves. Nargis Fakhri shinned the red carpet by wearing a strapless Komal Sood gown. The thigh-high slit gown looked perfect on the red carpet. Pink lips and glossy cheekbones finished her look. Mugda Godse wore a midnight blue Rajat Tangri gown. She looked like a beauty and kept her makeup light and accessories to a bare minimum. Leave a comment and tell us what celebrity you thought was the best and worst dressed!